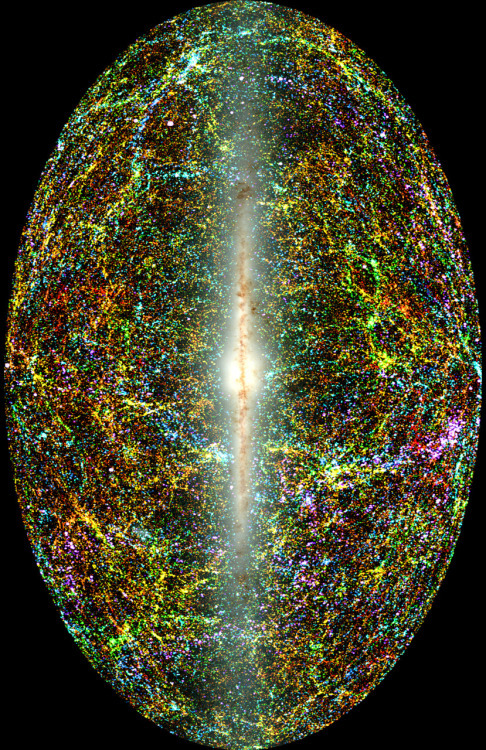 This all-sky view of the entire near-infrared sky reveals the distribution of galaxies beyond the Milky Way. The image is derived from the 2MASS Extended Source Catalog, which contains more than 1.5 million galaxies, and the Point Source Catalog, which holds nearly 500 million stars within the Milky Way. The galaxies are color coded for distances obtained by various surveys. The nearest sources are blue, moderately distant sources are green, and red represents the farthest sources.